Agronomic advancements have brought corn yields to new heights, but producers have had little guidance on how to meet the nutrient requirements of modern, high-yield corn hybrids in a way that maximizes their yields. As a result, the high yields we see today have been accompanied in many places across the United States by a significant drop in soil nutrient levels, particularly phosphorus (P), potassium (K), sulfur (S) and zinc (Zn). 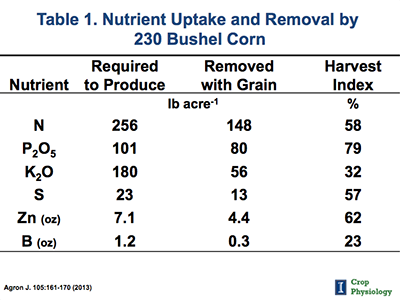 This combination—higher yielding hybrids and decreasing soil fertility levels—suggests that producers have not sufficiently matched their maintenance fertilizer applications with nutrient uptake and removal by the corn. By better understanding nutrient uptake and partitioning, producers can optimize their fertilization practices to meet their crop needs and attain maximum yield potential. 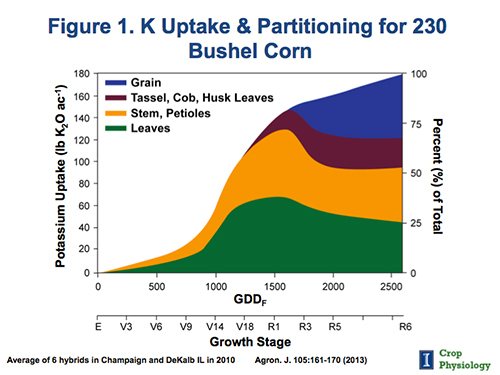 I’ll focus here primarily on the uptake, partitioning, and utilization of P and K by corn. Producers must consider the impact of increased grain and stover nutrient removal on the next crop and employ appropriate fertilizer strategies to ensure that adequate nutrients are available to the crop. Phosphorus is probably one of the most overlooked nutrients, and most farmers are not putting out enough. In relation to total uptake, nearly 80% of P is removed in corn grain, while K is retained to a higher percentage in stover. Production practices that utilize above-ground stover (i.e., cellulosic ethanol, silage production) may remove an additional 20.8 lbs of N, 4.0 lbs of P2O5, and 23.3 lbs of K2O per ton of dry matter, along with micronutrients. While farmers in Illinois, for example, fertilize 93 lbs P2O5 per acre, on average, for corn production2, the large majority (~80%) of soybean fields receive no applied P. As a result, they would have only the remaining 13 lbs/acre of P2O5 available for soybean production in a corn–soybean rotation3, where P and K fertilizer are commonly applied for both crops in the corn production year. This value would be inadequate to meet soybean P needs for total uptake (48 lbs/acre P2O5) or nutrient removal (30 lbs/acre P2O5) based on a conservative yield estimate of 46 bushels/acre in Illinois.4 Clearly, typical fertilization practices may need to be adjusted to meet crop nutrient needs. Mineral nutrients are not all acquired at the same time or used in the same way by corn plants, and some require season-long uptake by corn roots for the crop to achieve a high yield. 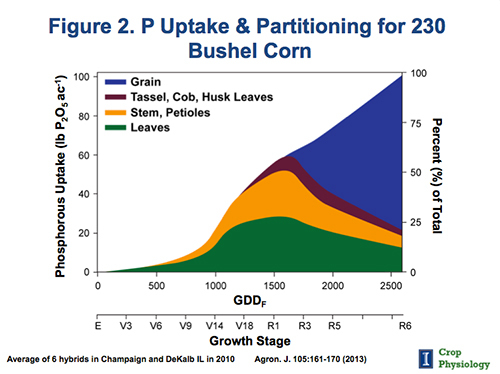 During the V10 to V14 growth stages, 230 bushel corn requires 7.8 lbs of N, 2.1 lbs of P2O5 and 5.4 lbs of K2O per day, but these needs change at other times. To optimize their programs, producers need fertilizer sources that supply nutrients at the rate and time that match their plants’ nutritional needs. Potassium accumulates more than three-fourths of total uptake by VT/R1 (Figure 1)1, while over 50% of total P uptake occurs during grain fill (after VT/R1) (Figure 2)1, in addition to remobilization of 57% and 77% of the maximum measured leaf P and stalk P contents, respectively. This suggests that a season-long supply of P is critical for corn nutrition, while availability of K at levels that can meet the maximum rates of uptake during early season vegetative growth would be expected to meet corn nutritional needs, since the majority of K uptake occurs during vegetative growth. Thus, practices that are effective for one nutrient may not improve uptake of the other. Nutrient management is complex, but improved fertilizer use can be achieved by understanding patterns of nutrient uptake, partitioning, and utilization. Producers should pay special attention to P requirements as productivity increases, as current data suggest a looming soil fertility crisis if adequate adjustments are not made in P usage rates. Agronomic advancements have brought corn yields to new heights, but understanding how to maintain soil nutrient levels can go a long way in helping to sustain high yields. Learn how biocatalyst technologies improve nutrient availability and uptake to help meet the nutrient needs of corn and other crops by downloading our Biocatalyst Technology FAQ Booklet. Bender RR, Haegele JW, Ruffo ML, Below FE. 2013. Nutrient uptake, partitioning, and remobilization in modern, transgenic insect-protected maize hybrids. Agron. J. 105:161–170. National Agriculture Statistics Service (NASS), United States Department of Agriculture. Fertilizer and Chemical Usage. 2011. Illinois Farm Report. 32:8. NASS. Fertilizer, Chemical Usage, and Biotechnology Varieties. 2010. Bulletin As11091, Illinois Agricultural Statistics. Usherwood, N.R. 1998. 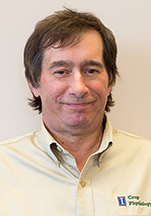 Nutrient management for top-profit soybeans. News and views. Bulletin RN 98105. Potash and Phosphate Inst., Int. Plant Nutrition Inst., Norcross, GA.